A typical Saturday for teens during the summer months includes sleeping well into the afternoon. But there was a different story on Saturday, July 12. Teens from across our Association came together to take part in the YMCA of Greater Boston’s first ever youth symposium titled #SELFIE. The term SELFIE is very relatable to the youth of today as it is a picture they take of themselves using a front facing camera and then plaster all over social medial sites such as Instagram and Twitter. 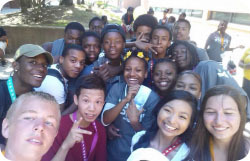 But on July 12, SELFIE meant “Self-Empowerment, Leadership and Fun Individual Experiences.” Over 200 teens embarked to UMass Boston bright and early to take part in workshops, team building activities, fun and a motivational speaker. Workshops allowed youth to explore such topics as building their brand, conflict resolution, stress management, public speaking and food photography. Over 30 volunteers and facilitators spent the day working with our youth to make sure they had a safe and fun day. Keynote speaker Charlie Rose, Senior Vice President and Dean of City Year, encouraged youth to focus on their own personal wellbeing as the world changes around them. Money raised by the Y's 2014 Boston Marathon team funded the event. To follow the day search on Instagram, Facebook and Twitter for #YSELFIE as the youth and staff spent the whole day sharing their adventures via SELFIEs! Sleepaway camp provides children with a unique opportunity to demonstrate independence and self-reliance while being introduced to all that the outdoor environment offers. Yet for many kids, the cost of resident camp is out of their family's limited budget. Thanks to a unique partnership between the Charles River YMCA in Needham, the Needham Public Schools, Needham Guidance Department and Needham Housing Authority, six local children ranging in age from 8 to 13 were awarded full scholarships to attend two weeks of camp in beautiful Wolfeboro, NH on Lake Winnipesaukee. For many of these kids, this is their first real trip outside of Needham and away from their families for an extended period of time. Civic, religious and nonprofit leaders from Needham get together regularly to discuss critical needs for children and their families in town. The need for a safe, healthy, engaging, outdoor experience like camp was a recurring theme at meetings. In total, this summer the YMCA of Greater Boston will award over $85,000 to more than 100 children to attend our resident camps in New Hampshire. NEW HUNTINGTON AVE Y WELLNESS CENTER IS OPEN! We’re open for business. Come on in! Phase One of the $30 million renovation of the Huntington Avenue YMCA is now complete and recently opened to members. Phase One of the renovation included a new pool, basketball court, handball/racquetball courts, steam and sauna rooms, fitness studio space and classrooms. Phase Two will be completed in the fall and includes an interactive lobby, child watch, dedicated teen space and additional exercise studios. We are excited to report that construction has begun on the West Roxbury Y renovations. The old post office on Centre Street has been demolished (pictured below, right) and the area is being prepared the installation of utilities. A temporary wall has been installed in the gym, which is currently housing the fitness center. Next up will be cutting openings in the gym walls for new windows. The former wellness center has been gutted (pictured below, left), and crews are beginning work on the new, updated locker rooms, which will be completed by the end of 2014. The entire renovation project is scheduled to be finished an open to members in December 2015. Membership activities, classes, swimming lessons and summer camp are all in full swing, despite the physical changes in the building, and we are grateful for the patience and understanding of our members as we work to create a more welcoming and inclusive facility. To get the latest news on this project, sign up for our email list. It is estimated that diabetes affects nearly 26 million Americans and costs $245 billion in direct and indirect costs, $4.3 billion in Massachusetts alone. An estimated 79 million Americans are pre-diabetic, with only 11% of those aware that they are pre-diabetic. The Center for Disease Control (CDC) predicts that if current trends continue by 2050, one in three Americans will have diabetes. 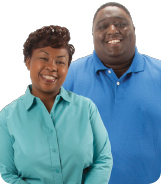 Starting this September, the YMCA's Diabetes Prevention Program will help adults at risk for Type 2 diabetes reduce their risk for developing the disease by taking steps that will improve their overall health and well-being, and supporting their efforts. The program is an evidence based approach, based on CDC and National Institute of Health funded studies, that have proved to help pre-diabetic individuals reduce their risk for diabetes and the myriad health complications associated with the disease. This year, the YMCA of Greater Boston is launching this national program in the Boston neighborhoods of East Boston, Roxbury and Hyde Park - communities facing the greatest health disparities. Through a generous grant, Boston Medical Center HealthNet Plan (BMCHP) is partnering with the YMCA of Greater Boston to bring the YMCA's Diabetes Prevention Program to the Roxbury Y and improve the health and well-being of low and moderate income families. BMCHP will support the first four classes for the YMCA's Diabetes Prevention Program in Roxbury, enrolling 46 pre-diabetic adults. To learn more about this program, please email us. 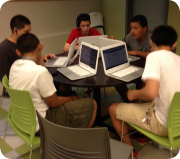 Amongst the hustle and bustle of campers and exercisers this summer, a small group of high school students will be busy studying math, science and English subjects at the East Boston YMCA. Through an anonymous $40,000 donation, the East Boston Y will continue to operate, in partnership with East Boston High School (EBHS), a state-of-the-art Credit Recovery Center where students who have failed a class or did not receive full credit for classes can make up these credits on-line, at their own pace, at the Y. This represents the first time this type of center is offered at a non-Boston Public School site. Each year, approximately 100 EBHS students are not promoted to the next grade due to poor grades or not achieving the required number of credits. A student who lags behind, even one credited course, has greatly diminished odds of graduating on time, and increased odds of dropping out of school altogether. Approximately 50 students drop out each year. Our program at the Y works because students are able to learn at their own pace in a more relaxed and social environment of the Y. Students have access to on-site coaches that can provide motivation and encouragement to students as well as tutoring. Working together with BPS we’re providing youth a second chance to succeed in school and beyond. Our camp programs are in full swing, with fun, sun, swimming and summer learning taking top priority at all of our sites. This camp season was made possible by over 200 corporate volunteers who helped us clean and open our day camp sites and Y facilities this spring. 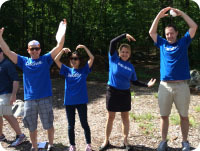 Special thank you to our corporate partners State Street Financial,Deloitte and Liberty Mutual, who joined us last month at our Ponkapoag Outdoor Center in Canton, our camp site at Hale Reservation, and our youth center in Egleston Square. The YMCA of Greater Boston celebrated its Heritage Club members at an event at Wellesley Country Club on June 17. The Heritage Club is comprised of people committed to ensuring the legacy of the YMCA of Greater Boston for generations to come. Donors and board members throughout the New England area came together for a show of support for the mission of the Y and to hear the latest accomplishments and updates given by President & CEO Kevin Washington. Washington was joined by former President & CEO John Ferrell, an existing Heritage Club member, who shared achievements made over the past decade. Kevin Washington with General Board members Mike Daley and Evelyn Kaupp. Kevin Washington talks with Heritage Club members about their experiences at the Y's Sandy Island Camp. Washington stated that the Y is poised to serve as a major impact player in the areas of diabetes prevention, youth and teen development, and early education, and will continue to make major investments in our facilities and camps as we enhance the vision for the future. If you would like to learn more about how you can leave a legacy gift to the YMCA of Greater Boston please contact Kathryn Davids at 617-927-8199.